Finally, at last, hockey season has started. 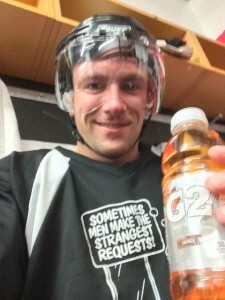 Just in time to wrap up my Summer of Sweat partnership with Gatorade Canada and see how my performance has improved on the ice. I had my first games of the season this past Saturday. Started the season with a bang and played in two games! I noticed from previous years that my overall cardio has definitely improved; I didn’t feel winded or sluggish on the ice. I have more explosive energy since I’ve been including more plyometrics such as box jumps, into my exercise plan. The days following the games I experienced a little bit of soreness, which is normal, but not as much as I had experienced in previous years (I did play two games after all). My improved cardio and allowing my muscles to recover fully following the games played a big role in keeping the DOMS (delayed onset muscle soreness) away! Losing a few pounds and eating cleaner also helped me feel less sluggish on the ice of course. Speaking of pounds – I’ve dropped down to 223 lbs – hockey will help me reach my goal weight of 220 lbs in no time. I haven’t reached 220 lbs yet most likely due to a few weekend trips and adventures. Life can’t be all work and no play! I didn’t exercise as much as I had planned while I visited Penticton, Victoria and Whistler over the past two weeks. 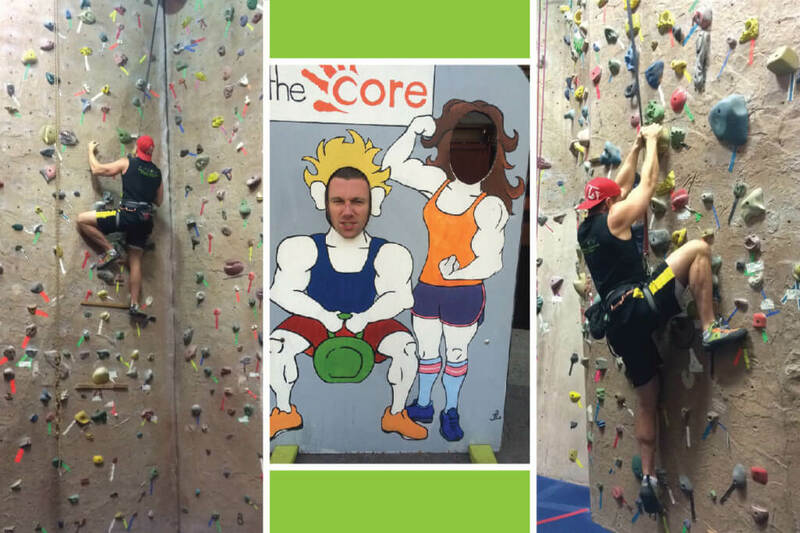 I tried to incorporate fun activities that would keep me active and moving – like indoor rock climbing and golf. I did recently have a minor set back – even with my personal training background I made a silly mistake. After completing my deadlifts (successfully), I strained my back when re-racking the barbell. I simply wasn’t paying attention or using proper form to do this. My advice to anyone incorporating weights into their training program is to ensure you learn from a certified personal trainer before attempting weight lifting exercises you haven’t practiced before, or before using heavier weights than you’re comfortable with. I also recommend asking for assistance if you need it putting your equipment away, especially if you’re fatigued. Consider your clean-up part of your workout! Stay focused; don’t get distracted, and pay attention to your form to avoid injury. Now that it’s a new season (hockey season that is, what other season starts around this time of year? ), I’m looking forward to keeping on track and continuing to follow my exercise program. I went into more detail about what my exercise program entails a couple of weeks ago here: https://www.kalevfitness.com/blog/gatorade-summer-of-sweat-how-i-keep-sweating/. 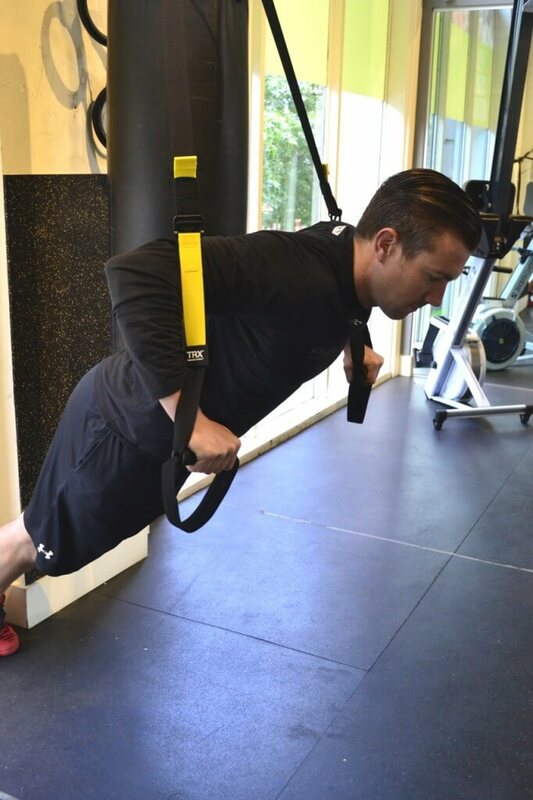 My training program includes a combination of compound and isolated weight lifting, cardio including intervals and plyometrics, stability which I often use my new TRX system for (seen below), and more! With the help of my team and facility at Kalev Fitness Solution I plan to get to and maintain my weight at 220 lbs, continue improving my cardio and plyo, and to Keep Sweating. The best thing is to keep moving, even with an injury as long as you’re moving safely and performing exercises correctly.